Information on Child health strategies is desired by all of us. Both as children and parents, we face a lot of questions on the path of children’s growth and development. I do not yet know parents who are totally satisfied with the health of their children. The worry starts from fetal growth onward. 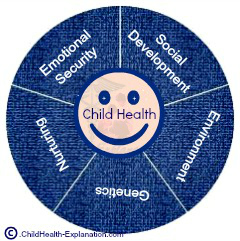 There are so many facets to child health!!! This not only makes it an interesting subject, but also a nagging cause for concern. At every turn there are disorders to worry about! Is my baby normal? How much should the child weigh? When will the child learn to walk and talk? How can I monitor my child's developmental milestones? I have often sensed the anxiety in my patients. I have always tried to clear their doubts, but yet more was needed. I wanted to reach you all. So here I am with children's health issues explained in an easy to understand format. In this era of new advances like the assessment of fetal growth on percentile growth chart, screening for ﻿genetic disorders﻿, and hormones' effect on fetal development, parents often feel terrified and helpless when the cause of jitteriness in a newborn baby or that of the fits in a little infant cannot be determined. Naturally then, they plunge into exploring the medical literature themselves. Healthy foods, essential nutrition, pollution hazards, media effects, and so on. The list is endless! Health is the most precious possession and children are the dearest. Nothing is more devastating than a sickness in the family, when all else; money, fame, a beach holiday etc, lose their value. It gets still more frustrating for children with chronic diseases. Why medical science cannot offer a cure? Why do pediatricians not have an answer to my child’s sickness? - And the compliance is lost. This is harmful for the child’s health. I hope the explanations here will help. Emotional insecurity, social deprivation, environmental hazards and more are hidden risks to children's wellbeing. Secondhand smoke and consumption of alcohol during pregnancy affect the baby during the fetal and the newborn phases. Rising air pollution has increased the risk to allergies and recurrent infections in infancy. In addidion, diabetes, obesity, eating disorders and cyber bullying are plaguing our tweens and teens. All these along with child abuse are preventable to a large extent with the right awareness. My effort here is to create a dedicated child health site. I wish to share my professional experiences and knowledge with you all. The site explains a lot of common health problems in children in an easy to understand format. In spite of my sincere desire and genuine efforts, it is yet not a complete guide on children's health problems. Certainly there will be a lot more questions. Ask doc your questions, participate in newborn care forum and have an explanation on any of your concerns on child health. Your suggestions are welcomed too! Let us together work towards a more comprehensive coverage on children's health, so that more and more children benefit from this "child health explanation" site. Your Encouragement is My Strength! Meet me is the back story of child health explanation and me. Child Health Blog keeps you up-to-date with all additions and changes to the Web site www.childhealth-explanation.com Subscribe here. Genetics regulates fetal development. Progression and transformation of a single fertilized cell in to a baby is intricate and vast. One small slip in the process …. Growth stages of the fetus determine the viability of fetuses born prematurely. Variation in growth during the fetal period often adds the risks. During childhood, essential nutrition for growth is superimposed on usual maintenance needs.Fatty acids are crucial for optimal brain development and iron for …..
Media effects on child health have been the topic of research for almost half a century, but the debate continues while some children do get affected-How? Pollution hazards lead to chronic childhood disabilities. Levels of toxins that were considered safe are now linked to chronic compromise of child health. Concept of school readiness is controversial, often interpreted as attainment of the required age and related childhood development.Ponder over, who is ready for whom! Contact information for childhealth-explanation.com Contacting me is easy..
Submission guidelines and agreement for childhealth-explanation.com that need to be followed by all who post their submissions to the site. Books for children are great fun for whole family. Besides a source of knowledge, they expand child’s horizons, build imagination, add awareness, improve self-esteem…..